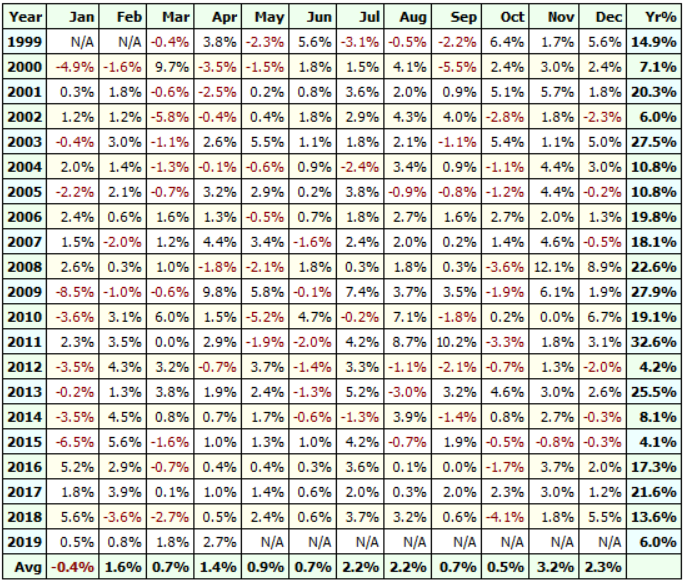 The core of any portfolio, the S&P 500 index is the benchmark index for equities in the United States. Simply being on the right side of the market trading the S&P 500 alone will make all the difference in the world in your investments. The model we've developed for the S&P 500 took years to perfect. Our model design utilizes Amibroker as our platform for testing, and Norgate Premium data as our data source. Our model uses the ETF 'SPY' during risk-on periods and the Vanguard Long-Term U.S. Treasury mutual fund 'VUSTX' during risk-off. 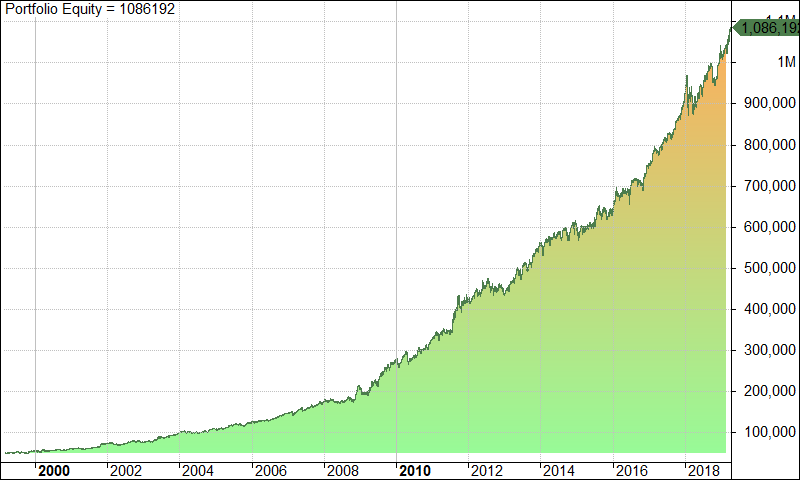 An initial $50,000 invested in our model on March 12, 1999 would now be worth $1,086,191.99--an annual return of over 16.5%. For buy-and-hold investors, their account would have a net profit of $113,280.21 as of April 12, 2019--an annual return of just over 6%. While we are pleased with the annual return of our model, what we consider most notable is its ability to limit drawdowns to just -12.8%, well within the risk-tolerance of almost all but the most risk-averse investors. 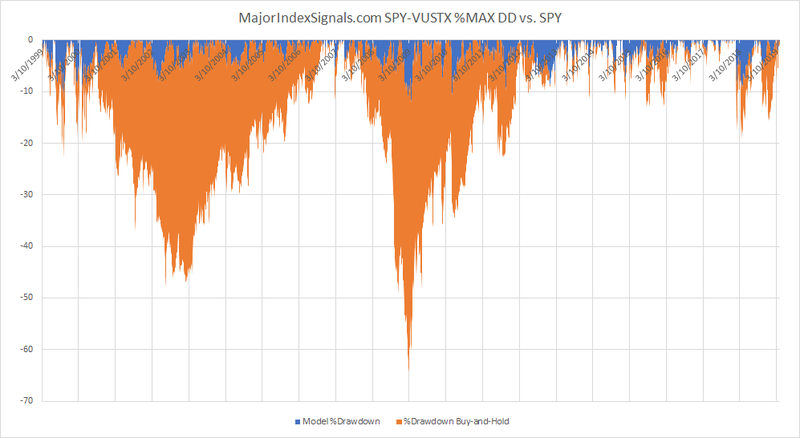 Buy-and-hold investors in the SPY would have been forced to experience two catastrophic drawdowns, the first following the bursting of the dot.com bubble, and the second during the financial crisis of 2008-2009 where the market declined over -55%! Note that in the latest correction, the model signaled to exit the market in early October 2018, well before the correction set in. Our indicator is monitored daily, with trades transmitted to subscribers after market close for the following trading day's open. We utilize both an email alert, and text-message blast system to alert subscribers. In addition, our indicator is designed so that we generally have several days warning of an impending trade.